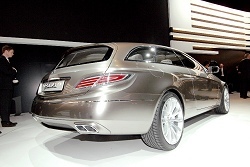 The 2008 Paris Show (also known as Mondial de l'Automobile) is officially the most exciting motorshow this year. We have full coverage. On the night before the first press day at the Paris Motor Show the car makers couldn't contain their excitement any longer, the VW Group in particular unveiling its wares at a private party. 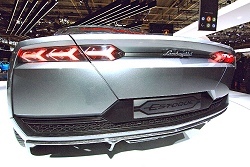 As we predicted, Audi and SEAT revealed new models in the shape of the A1 Sportback Concept and the Exeo saloon, but the show stopper came from Lamborghini in the shape of the Estoque four-door supercar. As stunning as Lamborghini's show car is, it was merely the beginning of a motorshow that contained more interesting new cars and concepts than we've seen in a number of years. Obviously the French manufacturers did their best to outdo each other with new showroom models, concepts and green cars galore, but virtually every other exhibitor of note had a couple of models worth checking out. Below you'll find a stand-by-stand rundown, with individual articles and our extensive picture gallery from the show linked to from the left-hand side. We really expected a surprise from Alfa Romeo at the show, but it hasn't materialised. The only new car on the stand was a Brera TI. The biggest news on Aston Martin's compact stand in Paris was the updated DBS, including the option of a Touchtronic 2 paddle-shift gearbox. On show in Paris was the revised Audi A6 range, including the S6 and new RS6 saloon models, but the star of the stand is the A1 Sportback concept, which is set to become a major rival to the MINI. Audi's new supercharged S4 also debuted, as did a 'concept' A4 TDIe emitting only 105g/km of CO2. One of the stars of BMW's stand is the new tech-laden 7 Series saloon and the ActiveHybrid version, though the facelifted 3 Series is also be on hand, as well the Edition Sport and Competition Package 6 Series models. 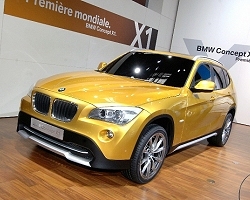 However, the Concept X1 steals the show with a sporting new look for next year's baby BMW SUV. GM's luxury division continues to have eyes for better European sales, which means powerful turbodiesels and the company's first ever estate car making their debut in Paris. 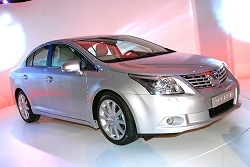 Chevy displayed the new Cruze, a family car designed to be sold globally and built on the same platform as the 2009 Vauxhall/Opel Astra. 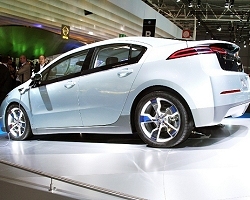 The Orlando 'show car' also shares those underpinnings and was on display in Paris, while the car attracting the most interest was the production-ready Chevrolet Volt. If we were asked to pick the single best show stand to visit, Citroen's would come near the top of our list. 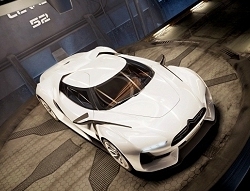 Along with the dramatic Gran Turismo show car, interesting Hypnos concept crossover and new diesel-hybrid technology, the C3 Picasso made its world debut. The compact MPV looks to be a star in the making, combining great looks with real versatility and no doubt good value when it arrives. 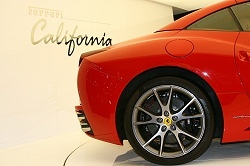 There's been so much said about the new Ferrari California already you'd think it was on sale, but in fact the Paris Show was the car's first real public outing. Unsurprisingly it looks even better in the metal than it does in our photographs, though we're still not convinced about the success of the new stacked exhaust pipe design. The 500 continues to dominate Fiat's presence at international motorshows. In Paris, the 500 Abarth esseesse made its entrance, alongside an impressive new racing version. The interesting Fiorino Qubo was also on display, replacing Doblo people carrier in the line-up. The all-new Ka will be one of the stars on the Ford stand, featuring striking looks and youth-orientated technology, along with a long list of customisation options. Buyers of the rest of Ford's line-up will also soon have the choice to make use of the Blue Oval's new Individual program. The Kuga in particular looks the part in its bespoke body kit. Star of the Honda stand was the company's new Toyota Prius rival, the Insight, though in 'concept' format. News is that it will undercut the Prius by up to £1,000 in the UK. The new Jazz also made its European debut, as did a facelifted Civic Hybrid. The Paris show coincides with the firm's first dealer opening in Western Europe. The stylish FX37 SUV also made its debut. Kia's new product onslaught stepped up a gear in Paris with the debut of the showroom-ready Soul MPV. There were seven versions of the new 'urban crossover' on the Kia stand, including a hybrid variant. Its powertrain is shared with the new production-ready cee'd hybrid on show too. Lamborghini's Estoque four-door supercar could be the most exciting car of the show. Relevant? No. Jaw-droppingly beguiling? Oh yes. Lexus revealed its new folding hardtop IS 250 Convertible in Paris, while the LS 460 AWD and LF-Xh concept were also be on display. The new drop-top IS looks good, though the stacked roof does add a lot of visual bulk to the rear of car and the rear deck is not quite as elegant as on BMW's £ Series Convertible. Maserati's Quattroporte S made its public debut at the Paris Show and the company also showed off its gorgeous GranTurismo MC concept racecar. As ever, Mazda had a concept to reveal. 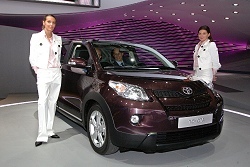 The new Paris vehicle takes the form of a city car called the Kiyora. A facelifted MX-5 was also on hand, alongside a 2.2-litre turbodiesel Mazda6 and the company's new stop-start technology, SISS. The new MINI SUV was aired for the first time in Paris, though in concept format. The show car is called simply the Crossover concept. It looks remarkably rugged in the metal too and very different to the current MINI line-up. Word is that it shares its underpinnings with the new BMW X1. Mitsubishi unveiled an all-new Colt in Paris and the Lancer Rally, a rally raid car, also made its debut, while the show also marks the official debut of the Lancer Sportback. The Colt will soon become available in Ralliart and Clear tec formats too, the latter Mitsubishi's new 'green' label. Big news on the Nissan stand is the debut of the Nuvu electric concept car. The Nuvu showcases technology that goes into production next year. Alongside, the new Nissan Pixo city car made its world debut, as did a mildly facelifted Note. Being its home show, Peugeot had plenty in store for us, including the new 308 CC and a 'Prologue' concept car previewing a new crossover, though the gorgeous RC HYmotion4 concept looks like the show stopper. Porsche launched the special edition Cayenne S Transsyberia in Paris and it was our first chance to see the new Cayman S Sport as well. There is loads of new metal on the Renault stand in Paris, including the new Laguna Coupé, Mégane five-door and Mégane Coupé in showroom-ready formats along with a couple of concept cars. One of which is the six-seat Ondelios crossover and the other, the ZE (Zero Emissions) based loosely on the new Kangoo be bop also making its debut at the show. 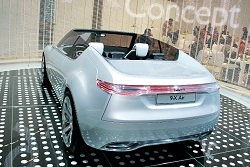 Saab's centrepiece in Paris was the rather tasty 9-X Air BioHybrid concept, which takes the coupé show car from Geneva and replaces the hard top with a folding one. Looks the business too. 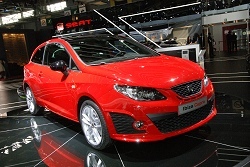 SEAT's new D-segment challenger, the Exeo saloon, made its entrance in Paris, as did Cupra and Ecomotive versions of the Ibiza. Skoda gave its Octavia a facelift in Paris, to bring it into line with the styling of the new Superb. Greenline and Sportline models were also on display. Ssangyong doesn't usually feature at the major international motorshows, but it brought its promising C200 crossover concept to Paris, hoping to break into the mainstream. Though not very exciting to look at, the new diesel-powered versions of the Subaru Impreza and Forester finally made their entrance in Paris, which is certain to see an increase in sales for the brand in Europe. 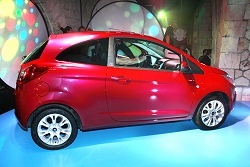 An all-new Suzuki Alto made its world debut at the Paris Show. Paris was an important show for Toyota, with its all-new Avensis receiving its world debut, alongside showroom-ready versions of the tiny iQ and the good-looking Urban Cruiser compact SUV. 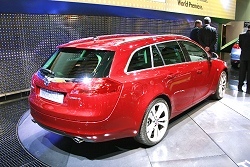 The Opel stand featured the stylish new Insignia Sports Tourer and Insignia EcoFlex. 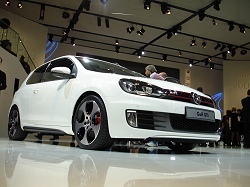 The new sixth generation Golf will be of interest for a lot of new car buyers, especially the new frugal BlueMotion model and the GTI 'concept', the latter shown in three- and five-door formats in Paris. 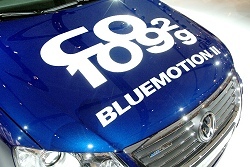 VW also revealed a new generation of Passat BlueMotion, emitting only 109g/km of CO2. Volvo's stand in Paris focused on reducing fuel consumption and emissions. The new DRIVe models made their entrance.